At the end of the 1999 Champ Car season, Dario Franchitti could have been forgiven for thinking that a major championship crown was not too far ahead of him in the future. The Scottish driver had just tied Juan Pablo Montoya at the top of the standings, but he missed out on the title because the Colombian had won more races that year. However, Franchitti had proved his capabilities, and surely it was only a matter of time before the title would be his. The wait may have been a lot longer than he expected, but it was well worth it. Franchitti became the third driver in as many years to 'do the double' in the IndyCar Series, as he followed up an Indianapolis 500 victory with a triumph in one of the most entertaining championship battles the series has ever seen. The 2007 showdown might not have had as many drivers fighting for the title as the series has seen in recent years - five drivers went into the 2003 finale with a chance of the title, while four were in the hunt last year - but the scrap between Franchitti and Scott Dixon was an epic. 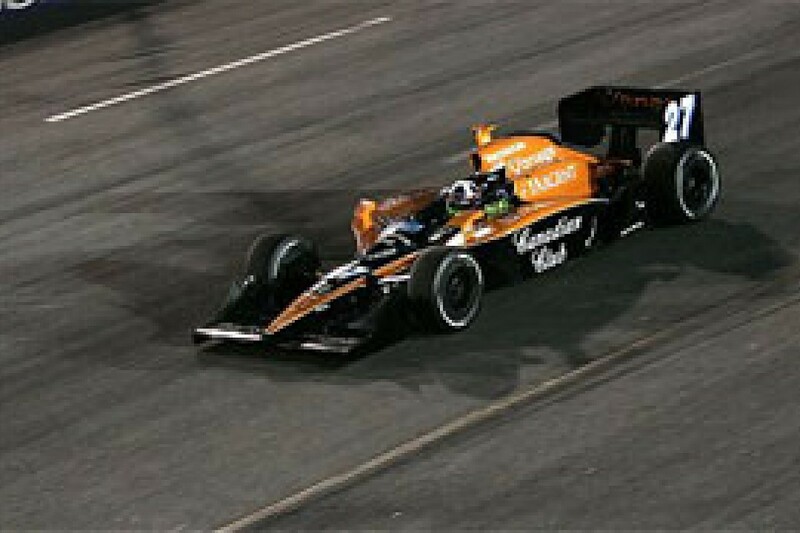 After dominating the series in 2004 and 2005, Andretti Green Racing were caught out last year when all of their rivals started to run the same Honda engines as they did. The special relationship with the Japanese manufacturer was no more, as Honda became the sole engine supplier for the grid. But it didn't create many other surprises, as the 2006 championship was fought out between the Penske and Ganassi teams. Sam Hornish took Penske's first title since they joined the series in 2002, and both teams were delighted to return to form after struggling with Toyota engines in previous seasons. But Andretti Green weren't going to take that beating lying down. The team worked hard over the winter, and while Dan Wheldon blasted out of the blocks for Ganassi again at the start of the year, Andretti Green were pleased that they had made good progress. The former champions got stronger as the season went on, but there were other shifts in power at the top of the tree as well. Penske lost a little bit of ground this year, while Wheldon failed to lead the Ganassi as the season wore on, and it was left up to Dixon to pick up the pieces from his high-profile teammate. Franchitti was quietly confident ahead of this year's Indianapolis 500, yet in the days leading up to the race few people seemed to care. The 34-year-old had not won a race since the end of 2005, and the media spotlight ahead of the big race was on the likes of Marco Andretti, Danica Patrick, and championship leader Dan Wheldon. In a media session on the Thursday before the race, Franchitti even admitted that he felt like the invisible man of the series. However, after racing in America for more than a decade, he also admitted that it was a role he was happy to fill. Just a few days later, Scott Dixon was facing similar questions about his status in the series. The Ganassi driver had just finished second - behind Franchitti - in the biggest race of the year, and he too admitted that he wasn't in the sport for the limelight. However, it wasn't long before only two names really mattered in the IndyCar Series. Patrick's media appeal, three-time champion Hornish, and the name Andretti, all took a back seat as Dixon and Franchitti went at it week-in week-out for the title. While Dixon moved into a narrow championship lead after the 500, he would have to wait a few more races before his title charge would really kick into high gear. Franchitti won two of the next four races, and Dixon found himself 65 points adrift of the Andretti Green driver after two bad results due to an accident at Texas, and a steering problem at Iowa. Franchitti's victory at Richmond on June 30 would be his last until his championship-clinching win at Chicagoland eight races later. He edged Dixon by four tenths of a second around the short oval, but he would not finish ahead of the Kiwi again until the penultimate round of the series. Dixon's run that followed should have been enough to wrap the title up with ease, as he won four of the next six races. But while it was enough to get him into the lead of the championship, it wasn't by much. At each of the races Dixon won during that six-race stretch, Franchitti was on the podium. Even when the Andretti Green driver took the first of his two airborne trips at Michigan, he landed on Dixon, and the Ganassi driver came away from that race with the same amount of points scored as his title rival. As the pair shared the stage at press conference after press conference, Dixon didn't hide his frustration at Franchitti's consistency. One slip was all he needed, but the closest he came to it was the eighth place finish that the Scot managed at Kentucky, just a split second before he launched his car up into the air for the second time in a week as he failed to see the chequered flag and clouted the back of another car. Even when Dixon finally scraped his way back into the lead of the championship for the first time since Indy, Franchitti had avoided a potential disaster to keep himself in the hunt. A misunderstanding between Franchitti and his teammate Marco Andretti as the Scot exited the pits at Infineon resulted in the pair colliding, and while it cost Dario a much-needed victory, he held on to take third place, partly thanks to Tony Kanaan, who opted to stay behind his teammate and good friend. It was a tremendous act of selflessness from the Brazilian, who was still in with an outside shot at the title by the time the teams got to the season finale. However, he categorically stated that not once did he regret his actions. Dixon had done the hard bit. He had got ahead in the title chase, but his championship run-in would all boil down to an empty fuel tank...twice. It is easy to forget that before that catastrophic splutter just seconds before the end of the season at Chicagoland, Dixon had already been bitten by a car running out of fuel. The only difference was, at Detroit, it wasn't his. In the closing laps at Detroit, Dixon was running behind Buddy Rice, with Franchitti close behind. Rice was running at the sharp end due to an alternate fuel strategy, but as the end of the race drew closer, Rice's time was nearly up. The Dreyer & Reinbold machine briefly lost momentum as it searched for those last drops of fuel, and Dixon sniffed a chance. However, Rice wasn't coming to a complete stop just yet, and the pair collided at the next corner. Dixon spun, and as Franchitti went to pass, the red car swerved across his path. No caution was thrown, so marshals were reluctant to go out onto the track at first, meaning the title rivals were stuck in the middle of the track, staring at each other. Franchitti eventually got going again to finish sixth, while Dixon was classified eighth. However, that messy little episode - caused by a car running out of fuel - had put Franchitti three points ahead going into the season finale. While there was little shock that team boss Michael Andretti immediately accused Dixon of moving into Franchitti's path, it was more surprising that Franchitti wouldn't accept that the move was deliberate.